Thaw Eli's Carrot Cake at room temperature for 2-3 hours. Once thawed, store at room temperature (or in the refrigerator) for up to 5 days. To serve, remove thawed dessert from box and remove shrink wrap and collar, if applicable. Remove the papers from each slice before serving. For best flavor, serve at room temperature. Frozen: Eli's layer cakes can be stored frozen at zero degrees (0F) for up to 9 months, tightly wrapped. 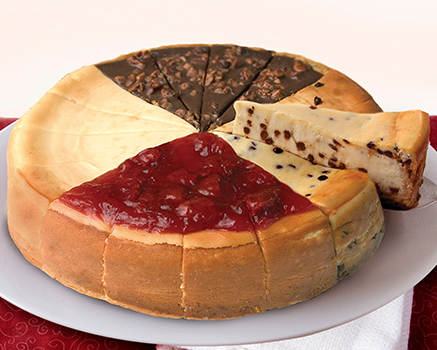 Refrigerated: Once thawed, Eli's Cheesecakes can be stored covered up to 5 days at room temperature or in the refrigerator. Chocolate Cake [Bleached Wheat Flour, Sugar, Brown Sugar, Cocoa Processed with Alkali, Soybean Oil, Sodium Bicarbonate, Wheat Gluten, Xanthan Gum, Sodium Alginate, Guar Gum], Powdered Sugar, Butter (Cream, Salt), Water, Egg, Sour Cream (Cultured Nonfat Milk and Cream, Cornstarch, Whey Protein Concentrate, Guar Gum, Carrageenan, Carob Bean Gum, Enzymes), Corn Syrup, Bittersweet Chocolate (Sugar, Chocolate Liquor, Cocoa Butter, Butterfat, Vanilla, Soy Lecithin, Salt), Cream Cheese (Pasteurized Milk and Cream, Cheese Culture, Salt, Carob Bean Gum, Guar Gum), Chocolate Sprinkles [Sugar, Chocolate Liquor, Cocoa (Processed with Potassium Carbonate), Lecithin (Emulsifier), Confectioner's Glaze, Corn Syrup, Salt, Vanillin], Soybean Oil, Chocolate Liquor (Processed with Alkali), Cocoa (Processed with Alkali), Corn Starch, Pure Vanilla, Stabilizer (Gum Acacia, Propylene Glycol Alginate, Xanthan Gum). Contains Wheat, Milk, Egg, and Soy. Manufactured on equipment that processes Peanuts and Tree Nuts.